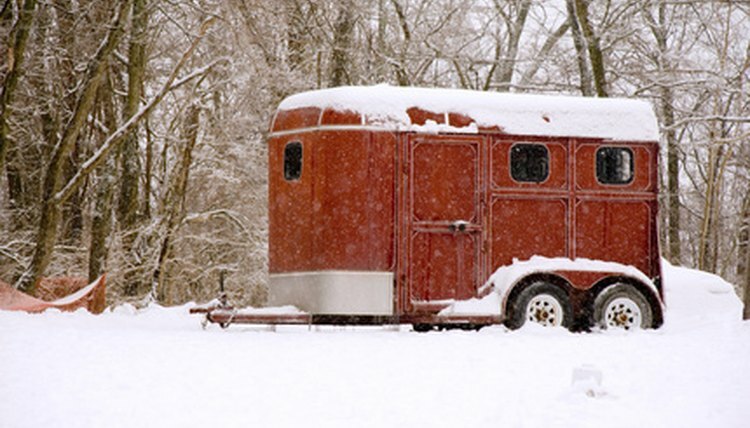 Sealing the joints in a horse trailer is straightforward, and quick attention to leaks can prevent serious and expensive problems down the road. Most modern horse trailer bodies consist of sheet metal panels (usually aluminum) welded to a frame. The joints are usually sealed with welds and another sealant. There are a number of options to seal leaking joints and prevent leaks. Examine the inside of the trailer for evidence of leaks. This could include stains on the carpet or other items inside the trailer or marks on the roof, usually in the area between panels. Also look up at the roof for evidence of cracks or tears caused by impacts from low-hanging objects. Repair the joints using a silicon caulk. Squeeze the caulk on to the inside of the joints from top to bottom, paying attention to the corners and points where two or more joints come together. Repair cracks or tears with a tape designed for roof repair, such as Tapecoat. Lay the tape over the crack and stick it down, then paint over with the sealant included in the product. If the crack is small enough, seal the inside using the caulk. Examine the caulk on the inside of the rest of the trailer to make sure there are no other points where the insulation is failing. Re-caulk any areas with an expanding foam type sealant. This will help keep keep heat in and water out. Spray or paint the roof with an RV roof coating. This will help water run off the roof of your trailer and keep the inside dry. Resealing everything on the inside will help prevent future leaks as well as stop those happening now. After sealing the leaks examine the wooden floor for signs of rot caused by the water. Use caution when working on the roof of your trailer, it may be wet and slippery. The roof may also be weak so it is best to use a ladder placed next to the trailer and not step on the roof.